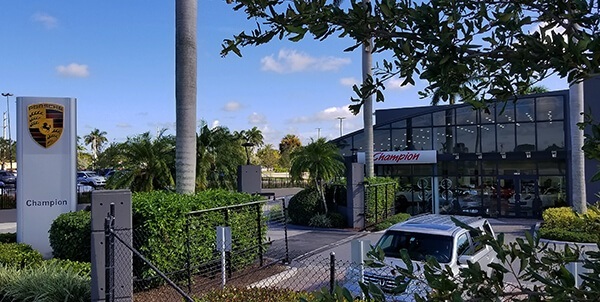 A local controversy is brewing here in Ft. Lauderdale, around Champion Porsche, who is the number 1 Porsche dealer in the U.S. Coincidentally, Champion is just a couple of miles up the road from our CarBuyingTips.com headquarters, so this added to our shock to learn one of the largest frauds ever perpetrated at a car dealership happened practically in our back yard. Someone call CNBC, this one looks like it belongs on American Greed. 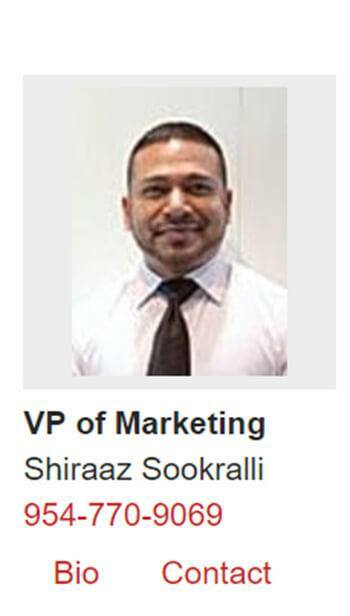 The allegations are that their former employee, commissioned salesman and VP of Marketing Shiraaz Sookralli defrauded at least 24 buyers out of $2.5 million, in deposits for ultra-rare Porsche 911 R vehicles that were not even available for Champion Porsche to sell. Sookralli allegedly did this without the knowledge of his employers and is also alleged to require buyers to wire unrealistically sizeable deposits to a bank account under a fake entity which he controlled. He is now missing in action. This follows an unfortunate string of news for this dealership as its owner, Devindar Maraj, also known as “Dave”, drowned at age 65 in the waterway behind the Boca Resort a few miles north of the dealership on July 22. He was a club member there and had been reported missing by friends. This all happened in Boca Raton just a few miles away from his massive Champion group of auto dealerships, which he purchased in the 1980s and turned it into the largest Porsche dealer in America. Dave was the driving force behind Champion Racing, which won the 24-hour LeMans in 2005, the last American team to do so. Well we know who he isn't! He's not a Champion Porsche employee anymore. He was a salesperson there for 10 years by time he left. He was also listed on the dealership's web site as Vice President of Marketing. We don't know when Sookralli left Champion Porsche, but his name and photo were still listed on the management section of Champion Porsche's web site at least up to August 15, 2018 when we are able to verify it last through archive.org. His name and likeness have since been deleted from the Champion Porsche web site. 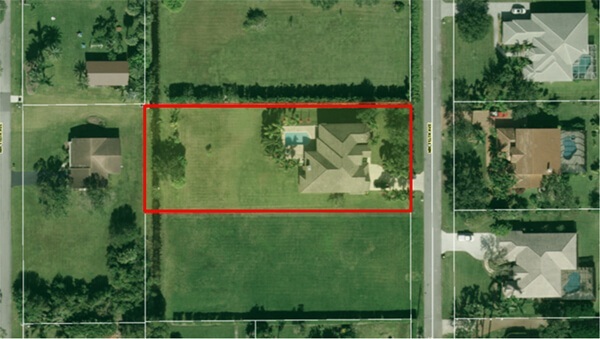 Sookralli's stated address was this opulent $1,275,000 estate shown below in Plantation Acres, just blocks away from the Bank of America account used to steer Porsche Buyer's money away from Champion Porsche. We started sifting through our local Broward Clerk of the Court web site to see what lawsuits we could dig up. Holy cow did we dig up some dirt, that plays out like a Hollywood thriller. Here is when the trouble started, the bubbling beneath the surface that should have triggered all sorts of red flags began on July 6, 2016. M & L Luxury Cars Inc., of Pompano Beach, FL, located less than 2 miles from Champion Porsche, entered into an agreement with what they thought was Champion Motors, the owners of the Champion Porsche dealership, through the former salesperson Shiraaz Sookralli mentioned above, to purchase a 2016 Porsche 911 R, which is based on the GT3 RS. This high-end exotic Porsche model is very sought after and has a window sticker price of $350,000, but for M & L, according to M & L's Lawsuit against Champion Porsche and Shiraaz Sookralli the selling price of this 2016 Porsche 911 R exotic car was an astounding $576,414, which was over $200,000 above the current window sticker price of this car at the time. This is the sandbox where the big boys play. 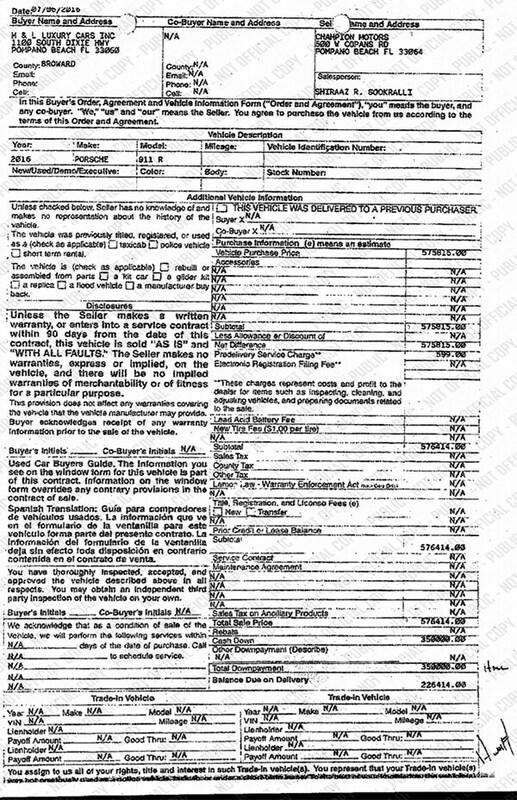 When you look at the paperwork above, who would ever know it was a fraud, it has Champion Motors on it listed as the dealership in the upper right corner, and it also shows Sookralli as the salesman in the upper right corner as well. This guy was smooth, heck I think I might even wire him some of my money! Sookralli's customer, M & L Luxury Cars, was required to wire a $350,000 deposit to what they were told was Champion Porsche, and the rest of the amount, $226,414 would be due upon receipt of their brand-new Porsche 911 R. We'll find out later according to lawsuits, that the funds were transferred to a Bank of America account in Plantation, FL under the control of Shiraaz Sookralli, not under control of his bosses at Champion Porsche. Wiring instructions which Sookralli gave to M & L Luxury Cars referenced a shell company named Rampage Motors Inc., a dummy company setup by Sookralli's wife, which you can easily lookup on SunBiz.org and see it there. Also, with other buyer victims, Sookralli allegedly setup shell companies with names like Champion Autosports to sound deceptively like Champion Porsche. There's your first problem right there. After never receiving their Porsche 911 R as promised, subsequently M & L Luxury Cars complained to Champion, who admitted being in default, and wired back only $150,000 to M & L Luxury Cars, leaving $200,000 of M & L's earnest deposit money not refunded. According to the 42-page lawsuit complaint, On May 25, 2017 M & L Luxury Cars threatened to sue Champion Porsche for "unjust enrichment" for overcharging them for the selling price of the Porsche 911 R. Champion agreed to refund the $350,000. 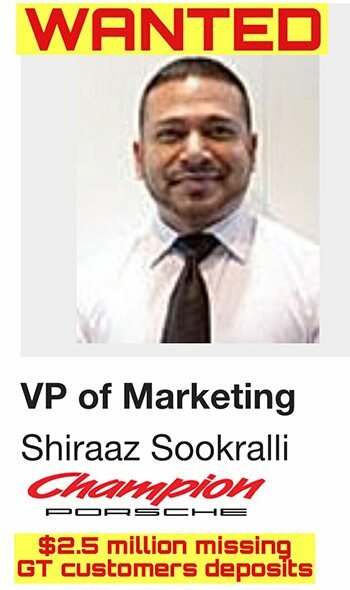 Could it be at this point that Champion knew they had a problem on their hands with their 8-year trusted VP of marketing who now may be a rogue salesperson, Shiraaz Sookralli selling a car they knew did not exist for them to sell? Shouldn't they have realized right then and there that there was no order in their system for a Porsche 911 R that the whole world wants to get their hands on? Who knows what confusion was going on. It sure seems to me like Champion was aware they had a hot tamale on their hands because according to the lawsuit filed by M & L in 2017, Shiraaz Sookralli then wrote a refund in the form of a personal check in the amount of $75,000 to M & L Luxury Cars, which allegedly bounced; one of at least 4 checks that M & L claims they received from Sookralli which bounced. Subsequent checks that Shiraaz Sookralli wrote to the plaintiffs, including another check for $75,000 and a third check for $200,000, and a fourth check for $150,000 all bounced according to the lawsuit filed against Champion Porsche and their salesperson Sookralli. Note to self, after the first check bounces, you don't keep going back to the well for more punishment, you call in the FBI and Secret Service with criminal charges of uttering a forged instrument, fraud, and money laundering. I question M & L's wisdom during all this. They simply failed to apply enough pressure on this pressure cooker of a scam to make it blow wide open. Eventually plaintiffs M & L Luxury Cars & Fellow Assets Inc. filed a lawsuit against Champion Porsche on September 29, 2017 alleging all sorts of debauched fraud including a “Claim for Breach of Contract by Champion”, Fraud, Unjust Enrichment, and bounced deposit refund settlement checks. According to Broward County Clerk of the Court documents, there appears to be some type of settlement based on a pre-trial arbitration/mediation of this lawsuit that took place on May 31, 2018. I have sat in on mediations before and I can tell you first hand that with arbitrations, both sides are guaranteed to walk away unhappy, and so you can bet M & L likely only got a portion of their allegedly defrauded deposit back. The lawsuit was voluntarily dismissed by the plaintiffs on July 2, 2018. My guess on this is that Champion Porsche probably agreed to cover the alleged fraud caused by their now former employee. This is pure conjecture on my part, but something made this hot fraud case just go away. Sookralli seems to have left a wake of financial damage and woes behind him in recent years, so Champion Porsche probably should have seen this coming, they should have seen the writing on the wall 2 years ago. 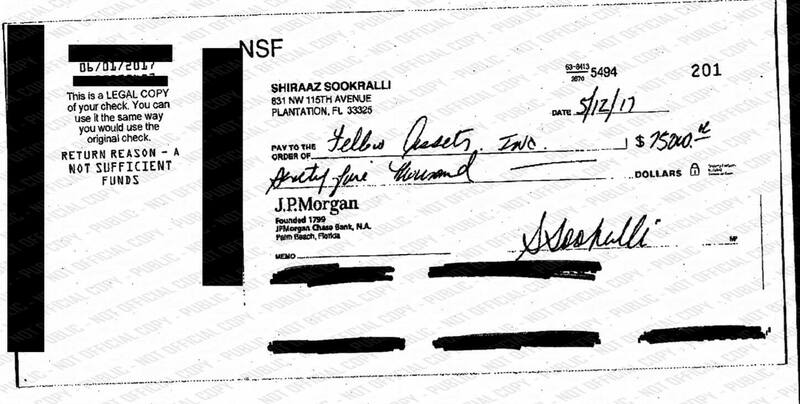 According to our trusty local Broward County Clerk of the Court filings, on June 21, 2016, American Express filed a lawsuit against Shiraaz Sookralli. American Express claims he ran up a whopping balance of $176,053 from 2 accounts. The first was about $141,835 from an American Express Centurian Card and $34,218 on an American Express Platinum Card. Both balances shown above are depending on which day they take the sample, as interest accrues daily. I've seen this type of credit run up scenario before, like when I bought a foreclosed condo at the Broward County Court, after the previous owner took out a maximum amount home equity loan, got the cash, and skipped town, leaving the condo to be foreclosed. Do you think Sookralli was running up the credit card balances to prepare for fleeing the country? American Express won the lawsuit and on August 23, 2016, the judge ordered garnishment of Sookralli's wages through Champion Porsche. American Express was awarded 25% of Sookralli's garnished net take home pay, and his bosses at Champion Motorsport, Inc. (The owners of Champion Porsche), are listed as garnishees, meaning they must deduct the money from Shiraaz Sookralli's paycheck. We don't know how much if any that American Express has recovered so far, because once everything hit the fan and this all blew up in their face, Sookralli was gone, no longer employed there, thus cutting off any garnishments owed to American Express. Apparently, Sookralli had setup a Bank of America account with a previously mentioned phony shell company he created, and the account was located at the BOFA branch at 12381 W Sunrise Blvd in Plantation, FL, across the street from the Sawgrass Mills Mall. This bank branch is just blocks away from Sookralli‘s listed home address on an acre plus luxury home in Plantation Acres. According to our research with the Broward County Property Appraiser, the owner of the house is someone in Sookralli's family, with the same last name, and he has used this address for years on other documents. Allegedly, Sookralli invented a DBA company called "Champion Autosport," which is deceptively similar, almost copycat of the real company Champion Porsche, that buyers, and people driving by the dealership seeing the sign know them as Champion Porsche. So, if you invent a name called Champion Autosport and you are the VP of Sales at Champion Porsche, every buyer will gladly make out a wire transfer to your fake company Champion Autosport. This guy could talk a pig into a ham sandwich with all these confusing brand soup smoke and mirrors corporate entity names. Who wouldn't trust this guy, who had worked at champion Porsche 8 years up to that point? On September 7, 2018 Copans Motors Inc., (Champion Porsche) filed a lawsuit against Shiraaz Sookralli, Devika Budhram, and Shiraaz's wife Vimla K Sookralli. 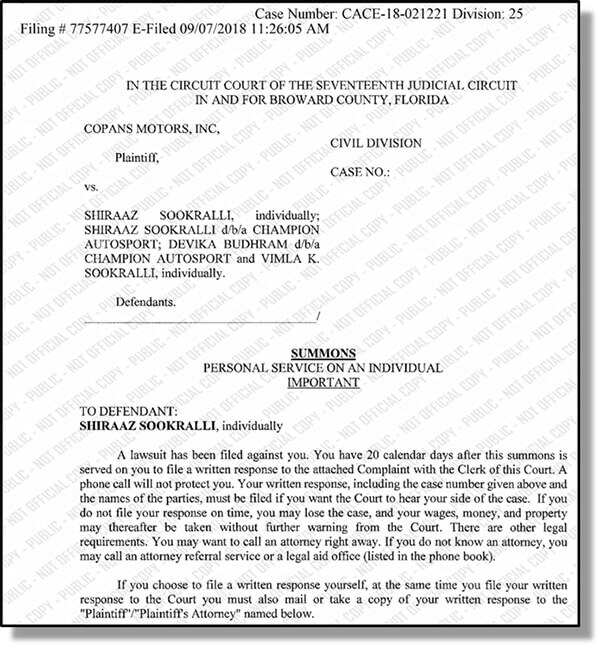 Copans Motors believes that “Devika was involved with and benefited from the activities conducted by Shiraaz.” The plaintiffs are alleging that Sookralli, while employed as a VP of Marketing at Champion Porsche, “misused the plaintiff's business operations” by creating fraudulent buyer deposit agreements outside the scope of his employment with the Plaintiff. The plaintiffs allege that Sookralli scammed buyers by making them think they were buying cars from Champion Porsche, and he thus had them wire sizeable deposits. Sookralli allegedly hid the fraudulent buyers' orders from the owners of Champion Porsche, obviously because he knew they were fraudulent, and thus he did not follow established procedures at Champion Porsche regarding the sales of Porsche vehicles, which would have allowed the dealership to track any such sales. The entire thing was a sham, there never were any cars available for sale under these contracts anyway, there was no allotment, and there were no records of any of these sales inside the Champion Porsche databases, because it was all done outside the system using fake buyers' orders, and wire transfers to the account controlled by Sookralli. The Copans Motors Inc. lawsuit alleges Sookralli received deposits of at least $2.5 million from at least 24 new car buyer victims. Now this seems farfetched at first glance doesn't it? It looks like buyers forked over an average of $100,000 each, so this might seem unbelievable to the casual observer who has experience leaving deposits for a new car. But, Sookralli has already tricked M & L Luxury Cars into wiring $350,000 to for their place in line to buy the ultra-rare 911 R. Sometimes the wealthy do stupid things with their money. Just look at all wealthy millionaires who lost their fortunes to Bernie Madoff and Scott Rothstein. The plaintiff Copans Motors won an injunction in court last week to have the Bank of America account frozen, but you can bet the money is all gone. I also question Champion Porsche's wisdom in all this as to why they allowed Sookralli to remain employed there, once they got wind of the first issue of M & L Luxury Cars getting ripped off in 2016 through 2017, and the bounced checks. Where is Shiraaz Sookralli now? That is anyone's guess, no one knows where he is right now. If I were him, I imagine I'd be out of the country by now, in India after having wired all my money offshore to the Cayman Islands, where no law enforcement agencies can get at it. Maybe this was planned for years, including running up American Express bills first, then walking away from them, and now the phony Porsche sales? We may never know the answer. Had the buyers done a simple check on Sunbiz.org, they would see there is no corporate entity called Champion Autosport, but there is a corporate entity with Sookralli's wife Vimla listed on it. So how he was able to get a bank account at Bank of America without real articles of incorporation is beyond me, unless that Bank of America account was just a personal checking account in his name, or maybe he gave Bank of America falsified articles of incorporation and phony Sunbiz paperwork. Note to self, buyers across America: when you're shelling out that amount of money folks, don't be an idiot, take 30 seconds to check a corporation out, and Google the name too. The only Champion Autosport I can find in Google is a Canadian transport company. Whenever you can, put all deposits on credit card so you can dispute the charge. Some cards give only 90 days to dispute, some bank cards can go 6 months, but at least you can dispute it if you sense something is wrong after leaving deposits. But with a bank wire, you'll never get it back once they transfer out the money you wire to them. Too many victims take too long to get back to the source of the money and try to stop the wire or try to claw back the funds. I've seen this time and time again over the many years that we have been investigating vehicle frauds, the victims wait too darn long to stop the bleeding. When you are told to pay suspiciously high deposits of cash up front just to hold your place in line for a car, you should be suspicious. I would think that $5,000 to $10,000 would be a more than fair amount of earnest deposit for a buyer to be asked to pay in advance. When dealerships place factory orders, they should receive a VIN# before long, and your name we would hope should be attached to that VIN# at some point, so demand your VIN as soon as possible. You also might try to contact the manufacturer to confirm if your name is in the system for this car. 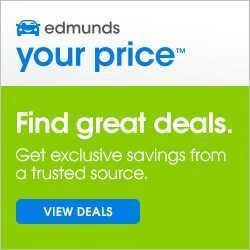 If you don't get a VIN# from the dealer, I would start to get worried, because all communication between car manufacturers and dealers related to your car order is through the VIN#. If there is no VIN in the system, there is no order, and you don't have a real deposit, just a rip-off loss. As a car buyer, if you put down any type of deposit, show up at the car dealership some time and talk to the cashier/bookkeepers and ask for confirmation of your deposit. Also confirm with them the account that you were asked to wire the money into, and make sure it is indeed an account controlled by the car dealership. If your salesperson was genuine, you can bet the finance side of the house knows about you and has all the records of your legitimate transactions. Use Google and other review sites to search for reviews of the dealership or your salesperson to see if there are any prior complaints from other buyers. If you are among the unlucky first few car buyers to be ripped off with an American Greed like scam, then you might not find any complaints yet. But once you get ripped off, please help the rest of the world by leaving bad reviews wherever you can, so that future victims can avoid the disaster that claimed your money. This ongoing story will be updated as more details as more lawsuits emerge, and as these current lawsuits work their way through the Broward circuit court of the 17th judicial circuit court dockets.